1875-05-31: SBC – Luis and Clement Arques to Estanislao Hernandez [unknown transaction]. Thursday, January 1, 1874 – Arques estate: to Yndart. Arques brothers on this date previously agreed to receive the last payment from Yndart who was to pay $15K 1/1/1874 in gold in San Francisco on the final day. Saturday, September 13, 1873 – Joaquin Bolado (of San Francisco) & surviving heirs of José G. Arques, Joaquin R. (of Santa Clara County), Clemente C., and Luis Arques (both of Monterey County) grant to Estanislao Hernandez for $2,460.00 all that portion of Santa Ana Rancho; (complex description) containing 351.52 acres. 1873-09-01: Joaquin R. Arques et. al. to Estanislao Hernandez [unknown transaction]. Saturday, August 30, 1873 – Yndart buys land – Joaquin R & Ellen Arques, Clemente C. and Luis Arques sell to Juan Yndart for $30,000 all of their interest in the Santa Ana Rancho; very complex description. lands from the Avy Patent. July 12, 1873 – Arques Brothers received from Martin Murphy a quitclaim to lands he sold them previously. Monday, June 2, 1873 – Martin Murphy of Sunnyvale (to Arques brothers) grants for consideration of $27,000 to the Arques Brothers his entire (HALF) interest in lots in Hollister and 7,935 acres on Rancho Santa Ana. Tuesday, April 1, 1873 – Arques Estate: Decree of Distribution. Brothers Joaquin R, Luis, Clemente C. Arques and Martin Murphy gave consent that the José G. Arques estate may be distributed. Wm H. Webb was the counsel for executors. Wednesday, January 8, 1873 – Bolado buys half of Juan Yndart's share of Arques' heirs land; Juan Yndart and Joaquin Bolado agree for consideration of $15,000 to be paid by Bolado upon Yndart making a valid conveyance transferring a clear title to the land of undivided half interest and right he has aquired from the Arques brothers Luis, Joaquin and Clemente in various lots described as 3894 acres (v.2 p. 300); the land should border Bolado's existing land. Book B of Agreements P. 64. 1873-01-01: Arques Estate agreed to sell to Yndart share of Rancho. Wednesday, January 1, 1873: Arques estate: to Yndart. Arques brothers on this date previously agreed to sell to Yndart (conditional on securing title) who was to pay $15K 1/1/1873 in gold in San Francisco; the brothers needed time to complete title ownership. Yndart was to pay $15K 1/1/1874 in gold in San Francisco final day. So Yndart owned half of Arques’s share, Martin Murphy owned the rest? Monday, December 2, 1872 – Owners of half of the Arques estate to Juan Yndart. …to Yndart (conditional on securing title) who paid $15K 1/1/1873 in gold in SF. The brothers needed time to complete title ownership. Yndart was to pay $15K 1/1/1874 in gold in San Francisco the final day. Yndart owned half of the José G. Arques Estate' share, Martin Murphy owned the rest? Recorded Monday, January 6, 1873. 1872-01-04: José G. Arques Estate: Will Filed. 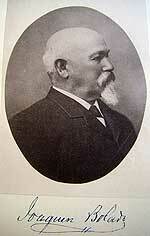 Monday, January 8, 1872 – Jose G. Arques' will endorsed and filed by his brother Joaquin R. Arques.